For more than sixty-seven years, Gordon and Louise built a legacy of love, togetherness, and service to their community. As they aged, their family began the difficult search for long-term care. Though they both were getting older, their needs were not the same – Louise required more care than Gordon, but it was important to their family for the couple to remain together, something they soon discovered was not possible in many facilities. It was with the Little Sisters of the Poor at St. Joseph’s Home that their son, Bruce, found his parents’ new home. The Little Sisters of the Poor was founded in 1839 in France, but their story here in Virginia began in 1874, when a small group of Catholic nuns arrived in Richmond. Continuing the mission of St. Jeanne Jugan, whose service to the elderly poor resulted in the establishment of the order of the Little Sisters, this group of women in Richmond committed their lives to the same community, welcoming elderly of all races, religions, and economic backgrounds into their home to be cared for as family. Today, their St. Joseph’s Home in Henrico is a refuge for many older adults who, despite a lifetime of hard work, are left without the financial means to cover the cost of long-term care in a traditional facility. 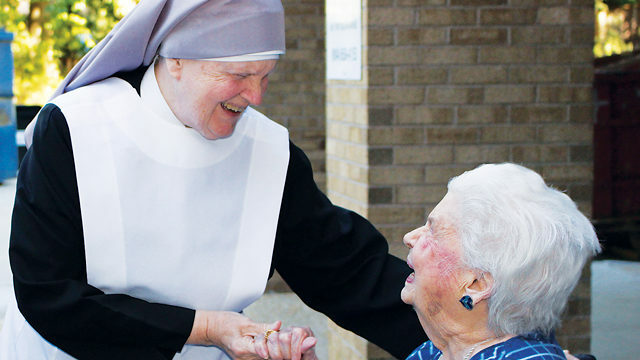 According to Mother Marie Edward Quinn, administrator of St. Joseph’s Home, over the years, the Little Sisters have evolved to meet the changing needs of the elderly as the population has begun living longer and residents are coming into the home older and in need of different levels of care. To ease the transition and meet the many needs, the Little Sisters opened the Jeanne Jugan Pavilion in 2002, adding independent living apartments to the assisted living and nursing care options already provided. Payment varies for each level of care, and generally, fees are based on a person’s ability to pay. Medicaid and adjusted rates are accepted. Continually striving to nurture the residents’ physical, mental, emotional, and spiritual health, the Home maintains a variety of programs. 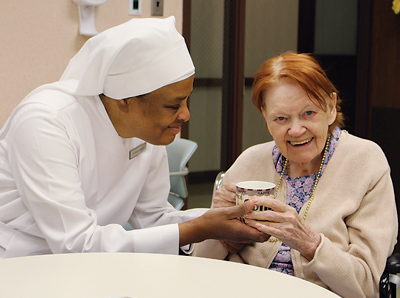 In addition to licensed nursing staff, ten Little Sisters live at the home and care for the residents around the clock. Residents have access to daily mass, as well as services from other religious denominations, on-site rehabilitative therapy, medical services such as podiatry and dental treatments, as well as a host of activities which comprise a holistic approach to meeting the spiritual and medical needs of residents. 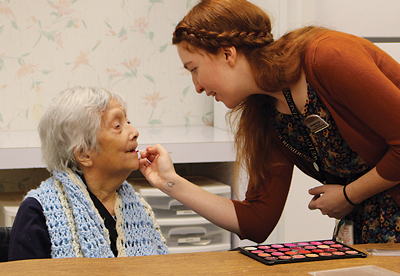 “We believe giving the residents the opportunity to participate in recreational, social, and volunteer activities – no matter how small – engages them mentally and emotionally, and fosters a feeling of belonging,” says Mother Marie. For Louise, that meant chatting with fellow residents, playing bingo, or baking apple crisp with the staff. Gordon preferred quiet moments with his wife or working on a word search. As Louise’s health declined, Bruce says he was comforted by the care his mother received from staff, and the presence of his father and the Little Sisters in her final days. “This is what we all wanted, to know that they were together, happy, and cared for so lovingly,” says Bruce.